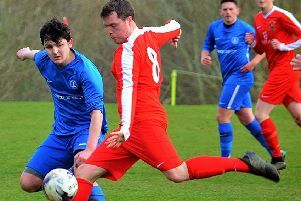 Jake Morrison’s late double shocked hosts Wallington after Jonathyn Quinn’s header got Alnwick back on the goal trail. It was a much improved performance from Alnwick, after having not won in their last four matches, scoring just a single goal. Hosts Wallington’s direct approach allowed Alnwick to win back possession often and Quinn appeared keen to make the most of it. In a more advanced position, he became the target man for most of Alnwick’s attacks in the first 45 and gave a glimpse of what was to come in only the second minute. Quinn gathered a long pass forward but with his back to goal, passed on responsibility to midfield partner Craig Muter, though the latter’s through ball was just slightly too heavy for the forward-running Scott Maddison. Eventually, however, the attacking approach paid dividends for Wallington, on the 15-minute mark when Jake Walton, about 25 yards out, found the net to put the hosts 1-0 up. The goal came rather against the run of play and the visitors showed they hadn’t got their heads down, arguably stating a case they should have been ahead before the break. Scott Maddison scored Alnwick’s only goal in four matches prior to kick-off and in this match and he was the recipient of two strong chances for his side. The first came from a header from a pin-point corner from Kieran Hogg. The second, a one-on-one situation, saw Wallington keeper Aaron Carr make a good save to keep his side 1-0 up at the break. Early in the second half, Maddison was to pay for his efforts missed in the first 45 when he was replaced by the returning Morrison who was making his first appearance of the season. But it was another threatening corner from Hogg which drew the visitors level. This time it was the impressive Quinn on the end of the cross, dominating in the air this time to power home his header from close range. Morrison was posing even more threat for the away side since coming on. With half an hour to go, Craig Muter sent Morrison in behind the defenders down the right. His cross was met by Quinn but his shot was comfortably saved by Carr. Wallington went ahead again shortly after a long throw into the box from Walton passed everyone but Simon Farrier, who powered home to put Alnwick behind again. But all their attacking promise eventually paid off for Alnwick and specifically Morrison. Leon Midgley’s introduction from the bench immediately made a difference. He controlled Hogg’s long free-kick forward, on the left of the opposition’s six-yard box. Unable to turn onto goal, he passed to his left where Morrison was lurking side on to goal. On the turn, his first-time left-footed effort simply cushioned the ball goalwards and into the far bottom corner. 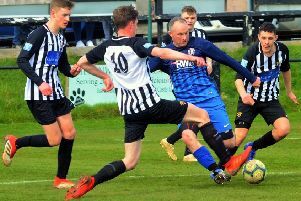 Wallington hadn’t suffered defeat since the turn of the year and Alnwick hadn’t experienced victory in four matches but the visitors weren’t finished yet. In added time, Morrison managed to flick the ball over his own head as well as his marker to put Midgley one-on-one. The shot was delayed, Midgley rather choosing to cut back onto his right foot and round his defender. His second touch took him further into the box where he was tackled and fell to the floor to appeals for a penalty. Nothing was given but a corner. This time Joseph Threlfall, off the bench, took the set-piece which lofted over everyone at the front and middle of the box, falling to the feet of Morrison at the back post. He took once touch to control the ball and his nerves, and then smashed the ball into the roof of the net to give Alnwick the victory at the death.